It is replaced by the Ithaca iTherm 280. Ithaca brand thermal printers provide bold graphics, industry-leading speed and incredible cost savings. The 80PLUS prints clear, crisp receipts and coupons at an incredibly fast 42.5 lines per second (135 mm per second). 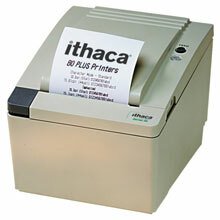 The 80PLUS is the only thermal receipt printer on the market that accommodates a 4-inch (diameter) paper roll. The price-per-receipt using an 80PLUS is lower than that of any other thermal printer. Thermal, single-color receipt printing, 5.3 ips, serial interface. Includes auto-cutter & power supply. Order cables separately. See accessories. Color: Dark gray. Thermal, single-color receipt printing, 5.3 ips, serial interface. Includes kitchen buzzer, auto-cutter, & power supply. Order cables separately. See accessories. Color: Dark gray. Thermal, single-color receipt printing, 5.3 ips, serial interface. Includes kitchen buzzer, auto-cutter, & power supply. Order cables separately. See accessories. Color: white. Thermal, single-color receipt printing, 5.3 ips, parallel interface. Includes auto-cutter & power supply. Order cables separately. See accessories. Color: Dark gray. Thermal, single-color receipt printing, 5.3 ips, parallel interface. Includes auto-cutter & power supply. Order cables separately. See accessories. Color: white. Thermal, single-color receipt printing, 5.3 ips, serial interface. Includes auto-cutter & power supply. Order cables separately. See accessories. Color: white.